Since the debut of their first electric sharpener in 1985, Chef’s Choice has become the leading manufacturer of diamond-abrasive sharpeners. 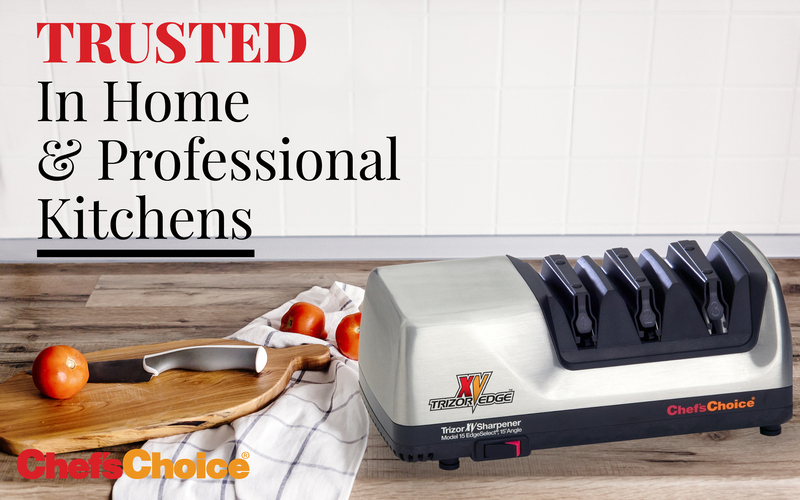 Chef’s Choice now offers a comprehensive selection of sharpeners for home and professional use, but their latest achievement is the Trizor XV EdgeSelect Sharpener. Utilizing Trizor® technology, the Trizor XV merges strength, durability, and extreme sharpness in a special triple-bevelled edge. The 3-Stage EdgeSelect system allows you to choose the edge qualities that suit your cutting needs; more bite for tougher foods, or finer slicing for delicate foods. It sharpens to a high-performance 15° angle, making the Trizor XV ideal for converting your traditional 20° knives to sharper angle. Whether they’re straight-edge or serrated, kitchen or pocket knives, the Trizor XV will get your blades sharper than they came from the box.